Slips and falls happen every day. In fact they are among the most common accidents with more than 1 million people suffering a slip and fall injury each year in the United States, of these more than 17 thousand die. Randall Spivey of the Spivey Law Firm, Personal Injury Attorneys, P.A., Ft. Myers, FL says slip and fall accidents are covered under the premises liability law and occur when uneven surfaces, slippery or wet conditions, or unexpected or hidden conditions are in the pathway. 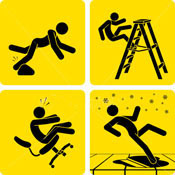 There almost always is a root cause to a slip and fall accident even if it may seem the person is just clumsy. Property owners - be they owners of homes, condominiums, apartments, shopping centers, stores, office buildings, parking lots or government buildings. By law, property owners are responsible for maintaining safe premises. If a railing is broken, a floor wet and slippery, or any hazardous condition exists, the owner must post signs for the general public or warn "invited" guests. (Trespassers are not necessarily covered.) Since children may be too young to read or understand cautions, owners are expected to take extra care. The damages for which you may be covered in a slip-and-fall accident are the same as other personal injury cases: Pain and Suffering, Out-of-Pocket Expenses, Lost Wages, Physical Impairment, Scarring, Inconvenience. You are forever barred from filing a lawsuit if you don't do so within the Florida 4-year statute of limitations. Should an accident occur on government property, the timeframe is shorter, and you must submit a written notice before filing the claim. It is essential that you retain the best personal injury attorney to protect your interests - a personal injury attorney with a proven record of success, a Board Certified Trial Attorney and recognized by his peers as having the highest legal ability and ethical standards as does Randall Spivey of the Spivey Law Firm, Personal Injury Attorneys, P.A. If you or you know someone who may have suffered a slip-and- fall, please contact the Spivey Law Firm, Personal Injury Attorneys, P.A., Ft. Myers, FL - exclusively handling personal injury and wrongful death cases. Randall L. Spivey is a Board Certified Civil Trial Attorney – the highest recognition for competence bestowed by the Florida Bar and a distinction earned by less than 2 percent of Florida attorneys. He has handled over 1,500 personal injury and wrongful death cases throughout Florida. For a free and confidential consultation to discuss your legal rights, contact the Spivey Law Firm, Personal Injury Attorneys, P.A., in Lee County at 239. 337.7483 or toll free at 1.888.477.4839, or by email to Randall@SpiveyLaw.com. Visit SpiveyLaw.com for more information. You can contact Spivey Law Firm, Personal Injury Attorneys, P.A. in Charlotte County at 941.764.7748 and in Collier County 239.793.7748.